The Capital Regional District: With thirteen members spread over 696.2 km² the CRD is roughly the size Calgary was in 2006, and somewhat larger than the GTA (Greater Toronto) area. However our population is considerably less than both areas, so we have a lot of space in which to live. 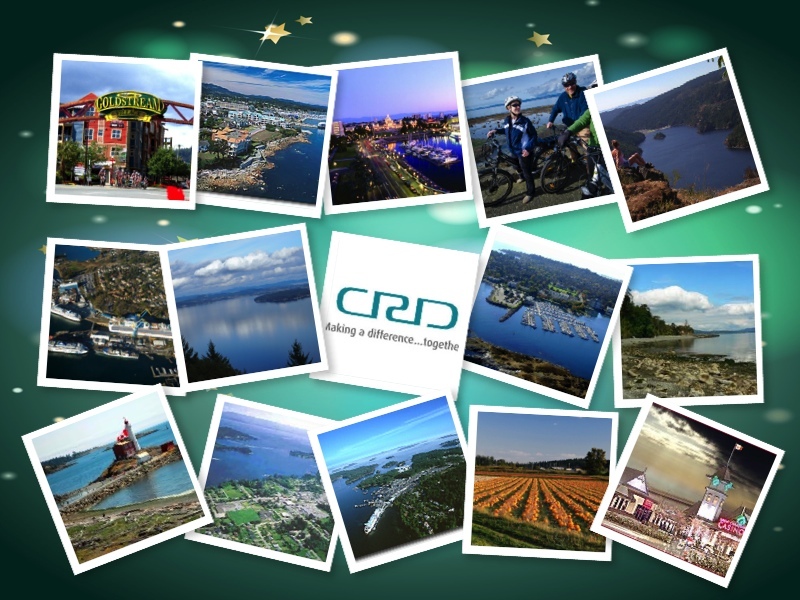 The CRD (including the Malahat), situated in a secluded corner of the Pacific Northwest, has within its small spread of 173,000 acres: mountains, inlets, bays, forests, farmland, an ocean boarder and dozens of streams, rivers and lakes on which long stretches of sun kissed sand provide beaches within fifteen minutes of almost every home in the region. Looking towards the eastern and southern horizons, you see snow capped mountains and a sprinkling of smaller islands around which killer whales, sea lions, seals and salmon entertain tens of thousands of visitors each year. 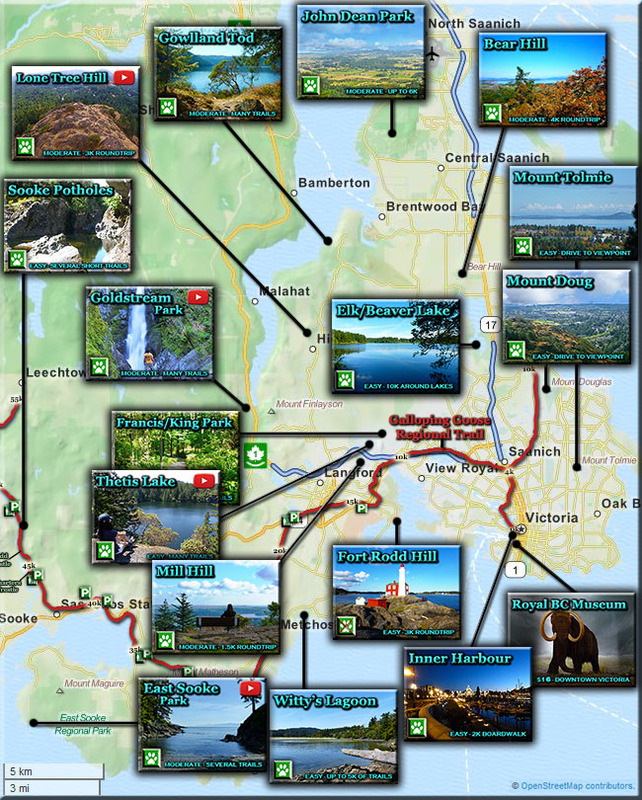 Trail Map: The CRD has a network parks connected by a seemingly endless series of hiking and biking trails that reach to every community from Oak Bay in the south to North Saanich, then west to Metchosin and Sooke. Because of the mild climate these parks and trails are heavily used year long (double click to open the map). The mild weather also draws large numbers of Canada’s top athletes to half dozen indoor and outdoor high performance centres sprinkled across the region. As part of the infrastructure, the CRD comes equipped with world class hospitals, schools, colleges, universities, libraries, recreation and sports facilities, entertainment and shopping, virtually everything a growing family might desire, yet there is still plenty of room for singles and seniors who desire to become fully engaged in a healthy life style. In a few words, the Capital Region is a pristine jewel in the Pacific Northwest that draws tourists and new residents from across Canada and around the world. Calgary also does that, but Oil Money is the game that draws the most people to Calgary. All things being equal, it would be difficult to find anyone in the CRD who would rather live, raise a family or retire elsewhere in Canada. Yet, despite this abundance, one member of the CRD family is constantly agitating to change the governing and administrative structure. To accomplish this they would amalgamate some or all of the parts into one unit with the goal of achieving ‘economies of scale’ and ‘efficiency’. To provide some balance to their negative campaign, this article is being updated.